Earlier this month, I’ve visited Taipei, Taiwan and Okinawa, Japan with a friend for the sake of curiosity and needing a break from New York City. If you have been checking out my Instagram, there were lots of delicious food and we stayed in very nice hotels. Both places were charming in its own way and the people are wonderful. To kickoff this series, I’ll be starting off with the famous restaurant in all of Taipei — Din Tai Fung 鼎泰豐. (We went to the original location on Xinyi Road but there’s many other locations around the city.) Sure, you may call this a touristy restaurant since it’s almost everywhere in Asia and parts of the West Coast of the U.S. but it does have substance behind the hype. 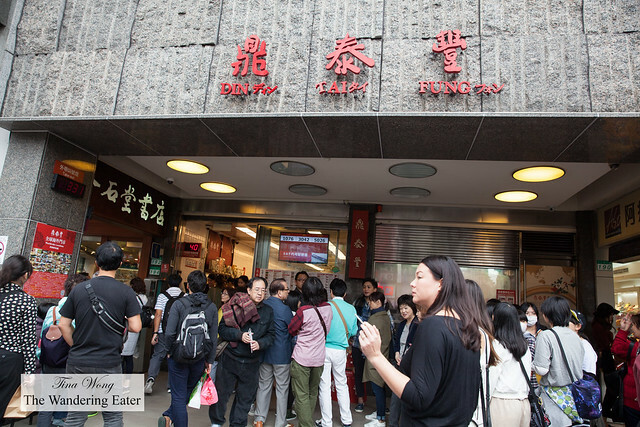 There’s a huge crowd of fervid tourists and locals alike crowding the entrance to the original location on Xinyi Road waiting for a table. 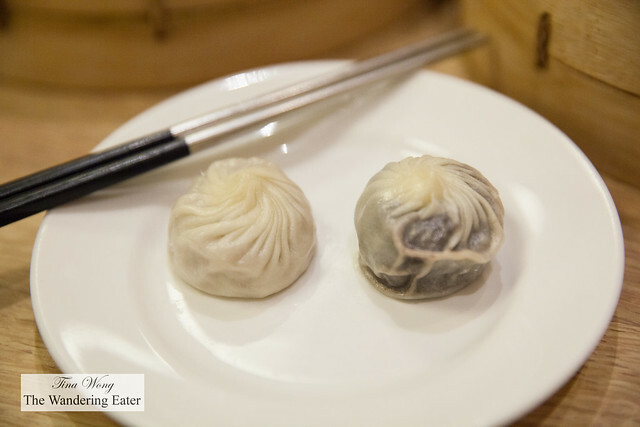 This location has five floors of dining rooms with the ground floor having a fervid that has a large window letting diners seeing the staff rolling, filling and folding the famous xiao long baos (XLB), also known as soup dumplings. 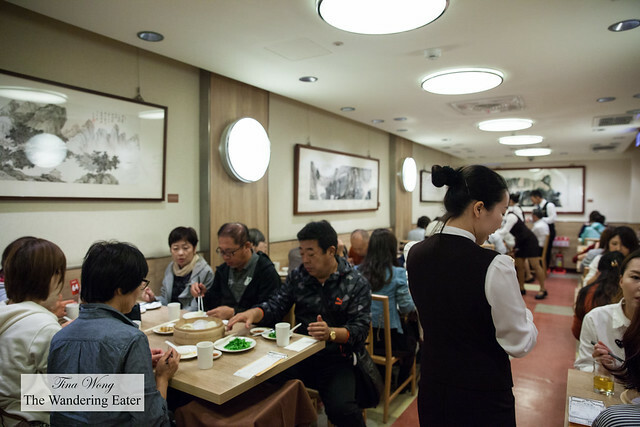 Walking up the narrow stairway leading up to the second floor, the dining rooms were still buzzing with activity of waiters and waitresses greeting guests in Mandarin, English and Japanese and trays containing the large steamer baskets filled with freshly made XLB and other dishes. Tables were turned over quickly to make way for the many who are waiting outside. Since we were feeling a little jetlagged, we started off the steamed chicken soup. This soup was minimalist but it’s fantastic. 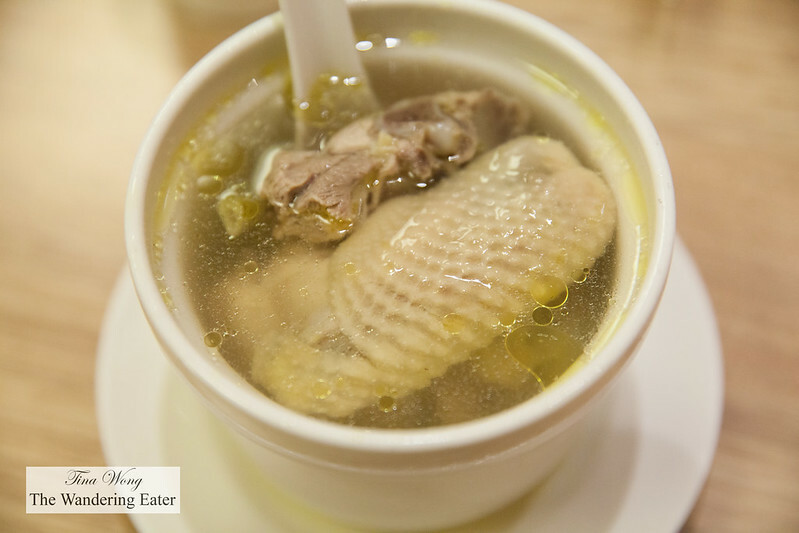 The pure chicken essence is distilled in the broth and it felt almost energizing and comforting to have this (even though it’s a mild low 70s degrees F temperature then). 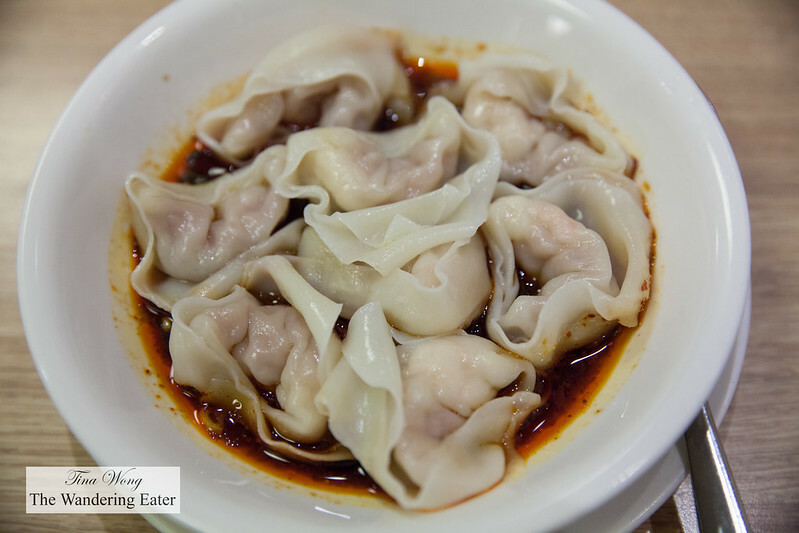 Next up were the Szechuan wontons in chili oil. Our waitress informed us that everything is made in house from the wontons to the sauce. 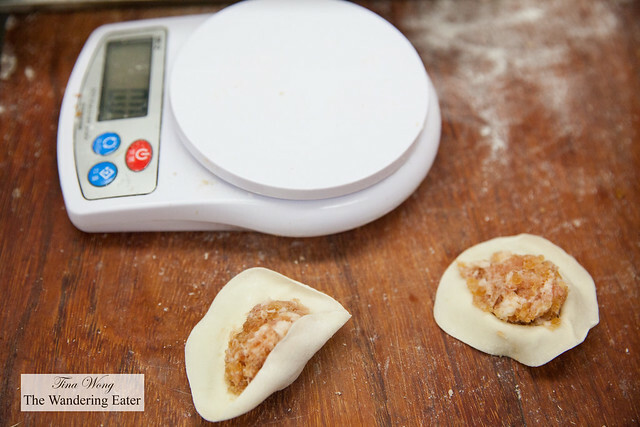 The wontons were indeed freshly made and was lean enough to balance the chili oil. That chili sauce was amazing. I wish I could buy a bottle of that chili oil and put it on almost everything. We had three different steamer baskets full of their XLB — original pork, black truffle and pork, and crab and pork. 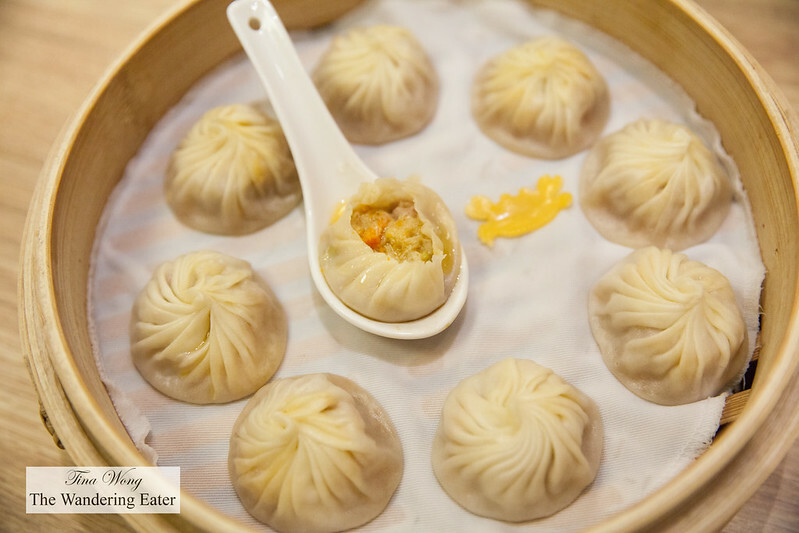 All of these XLBs were perfectly made from the correct thickness of the dumpling’s skin to the ratio of soup and filling. 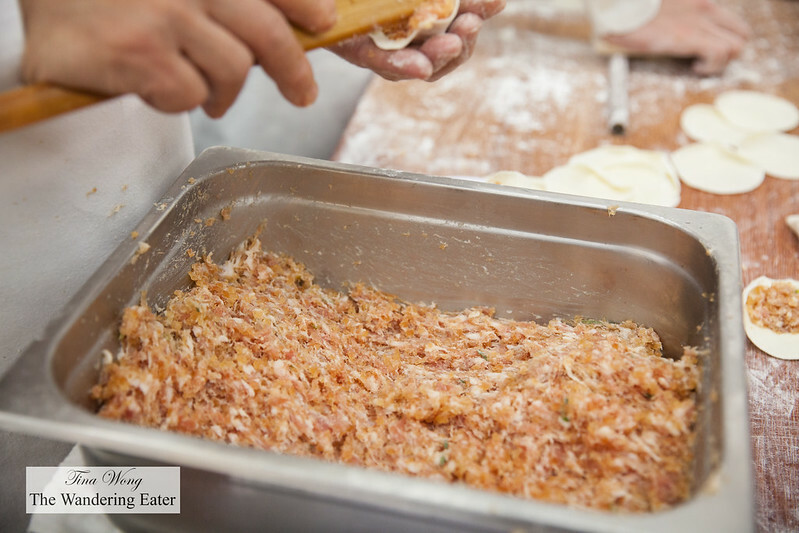 The original pork was delicious and well seasoned. 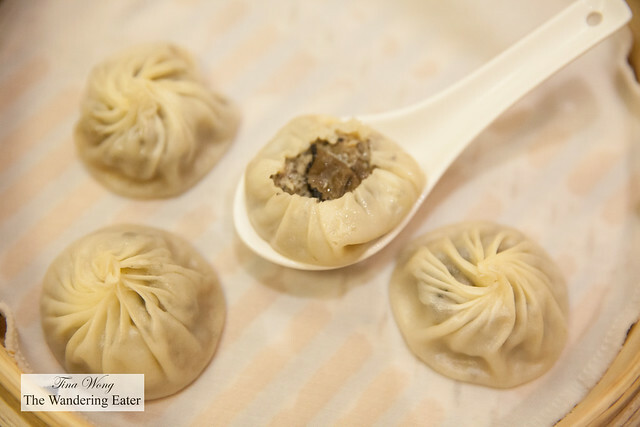 The black truffle has an actual shaving from a fresh French black truffle in each dumpling giving the dumpling a deeply savory and earthy flavor that’s uniquley a truffle’s and tastes luxurious. 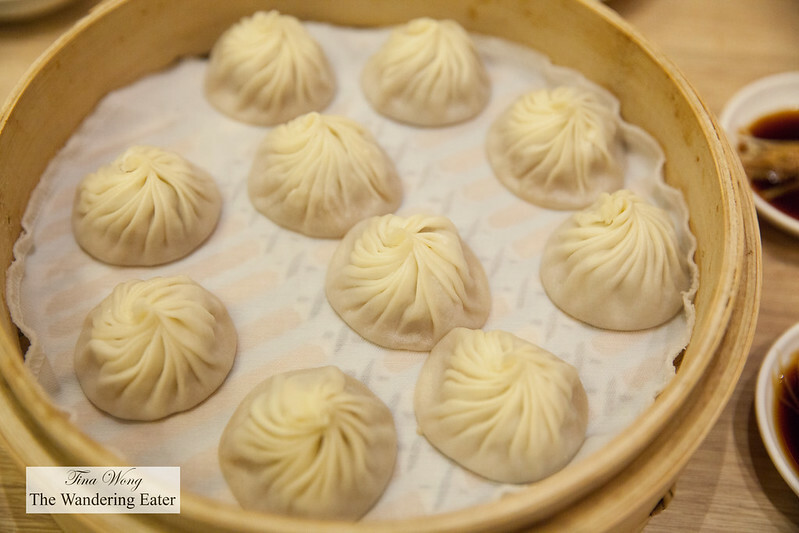 But our true favorite was actually the pork and crab XLBs; the light flavors of the pork is enhanced by the sweet crab meat and crab roe. 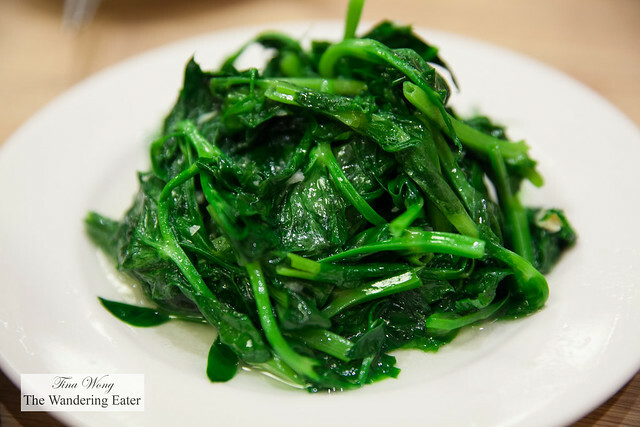 We felt that we should balance out our intense carb intake and had a plate of stir fried pea shoots with garlic. Both of the said ingredients were vibrantly flavorful and sauteed perfectly. 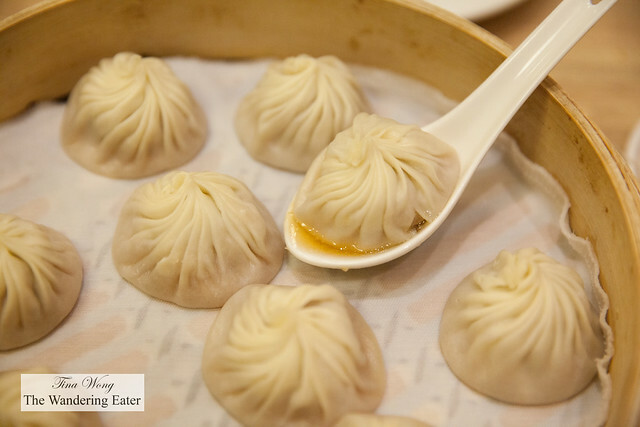 Though desserts are generally not a popular course ordered in this restaurant, it’s a shame not many people try them. Their sweet take of the XLBs like the steamed taro paste and sweet red bean paste XLB were delectable. The delicate, tissue thin dumpling skin were the perfect vehicles for the dense and creamy pastes. Instead of having the thick bread, the focus is truly on the just sweet enough fillings. 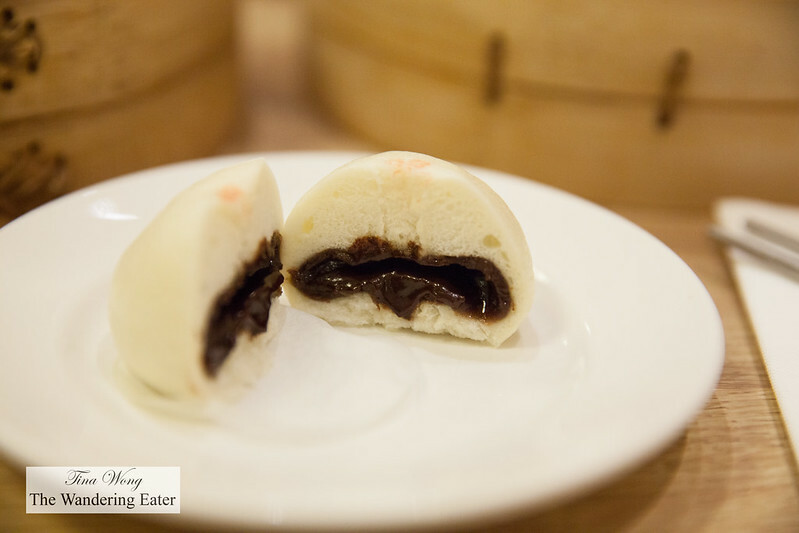 The newest dessert they have are a duo of steamed chocolate buns, where it’s like the steamed buns that you might be familiar when you have dim sum but filled with a gooey chocolate center. 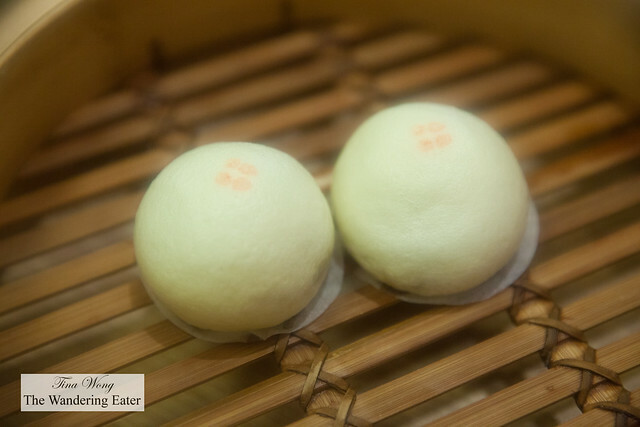 It is a bit richer than the taro or red bean XLBs but it’s not that sweet either (and that’s a very good thing). 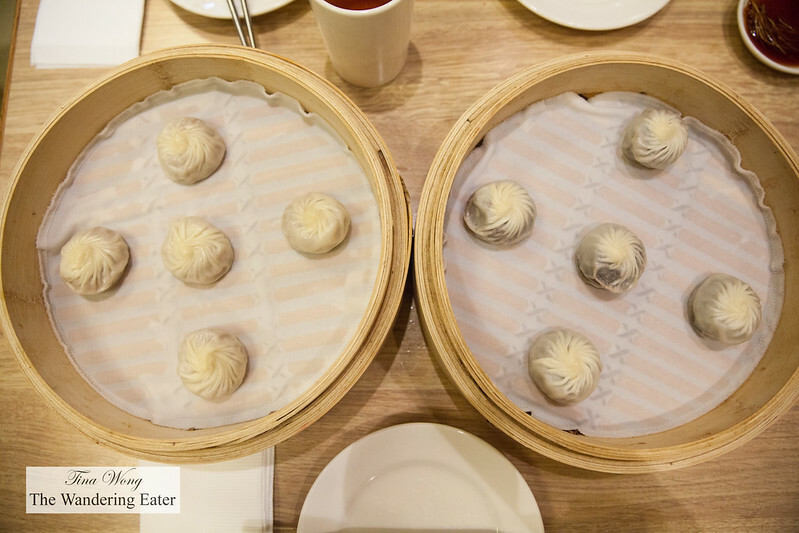 The steamed layer cake and steamed red bean rice cake were great too. When both are steaming hot, it’s feathery light and springy to the touch with just enough sugar in it to taste like a dessert. 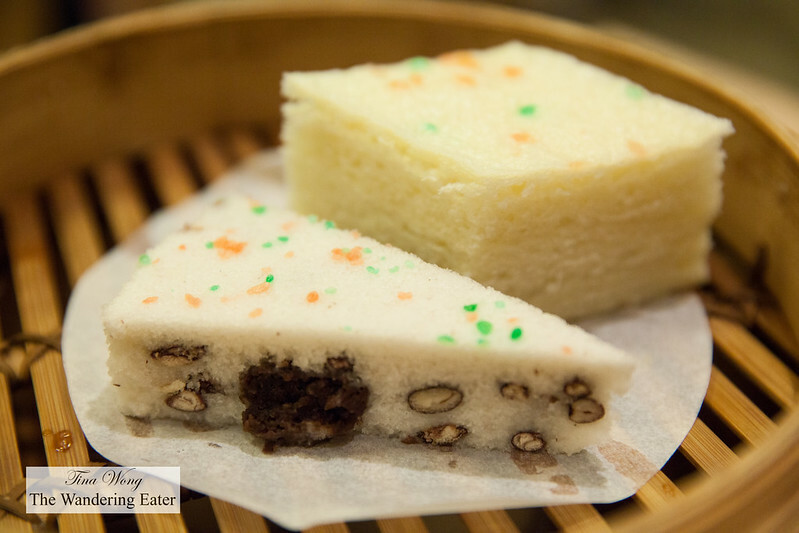 The red bean rice cake was slightly sweeter since the red beans mixed in it were lightly sweetened. The steamed layer cake was masterfully done since it does have the fine layers of cake instead of a large single layer. We were stuffed by the time we finished this meal and everything was deliicous. The wait staff were friendly and great on topping our cups of tea, despite having an onslaught of tables getting turned over quickly. 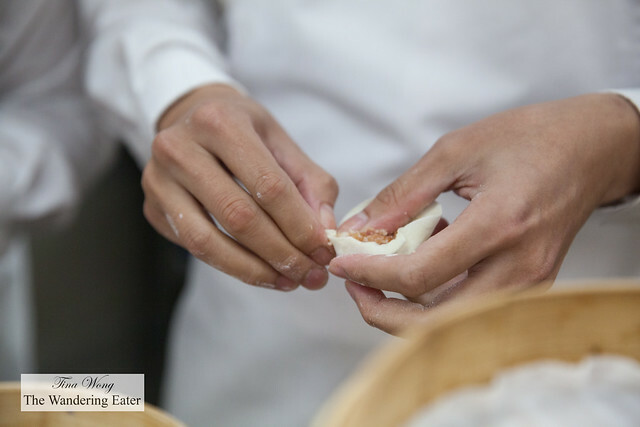 One of the staff members was very kind to let me into their busy, crowded kitchen (I have to be outfitted with a hairnet and surgical face mask before stepping in), letting me observe the staff for a couple of minutes wrapping the famous XLBs. It mesmerizes me how many they can do in a few seconds and thinking the hundreds or thousands they have to wrap everyday to keep up with the hungry crowds!